We don’t make movies any more here. It’s a war now. Even severe enemies can overcome (this) unnatural opposition and institutionalized slaughter.…(if they) trust in human kindness that will eventually prevail, if people are able to forgive, help and protect each other, even from their own people and at the cost of their own lives. A quiet film, with a small cast, a simple but lush location, and almost as little dialogue as action, Tangerines is all but a typical “war movie,” and yet it takes place in 1992 in the middle of Abkhazia where an idyllic tangerine plantation becomes a battle zone. Two Estonian neighbors, Markus (Elmo Nüganen), striving to harvest his tangerines, and Ivo (Lembit Ulfsak), building crates for them, are caught in the crossfire. 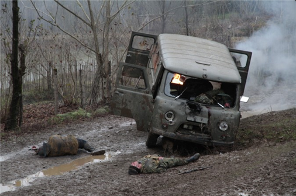 They bury the casualties, but two survive, the Chechen mercenary Akhmed (Giorgi Nakashidze) and the Georgian soldier Niko (Misha Meskhi). At least Ivo would have it that way. They will heal together under his shared roof, if they don’t kill each other first. 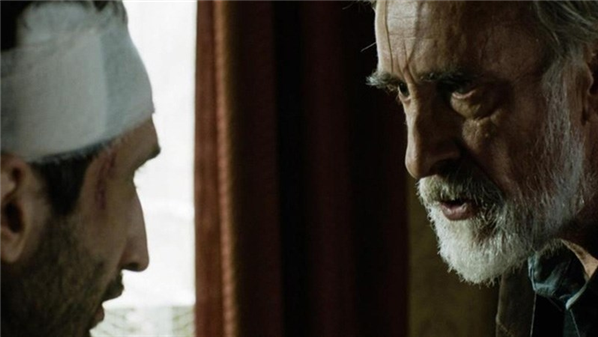 With his fifth feature film, a co-production between Estonia and Georgia, Zaza Urushadze has for the second time seen his work submitted for the Best Foreign-Language Film at the Academy Awards. It’s also a contender for the Golden Globes. I interviewed this esteemed Georgian filmmaker along with his Estonian co-producer, Ivo Felt, in Santa Monica amidst screenings of their disarmingly beautiful appeal for peace in Tangerines. 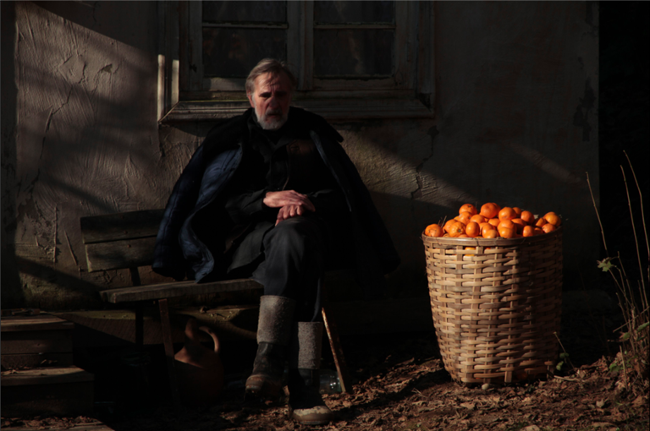 KINOCaviar: The lean and elemental musical score for Tangerines, recurring at intervals, feels like the refrains of a ballad, as if your film is telling a folk story about a local hero, an ethnic tale with a proverbial message, but sung to us with universal appeal. This feeling arrives not just with the music but also the tranquil rustic setting in nature, the homespun furnishings of the lonely countryside house — the family photos, the warmth of the stove, the meals “grandpa” routinely sets at his table — the lushness of the tangerines themselves. Ivo Felt: What you’re hearing is the panduri, a musical instrument that is a cross between the guitar and the mandolin. We wanted a score that would derive from both cultures, Estonian and Georgian. So the composer, Niaz Diasamidze, who is Georgian, listened to Estonian national music a lot and wrote it as a mix. 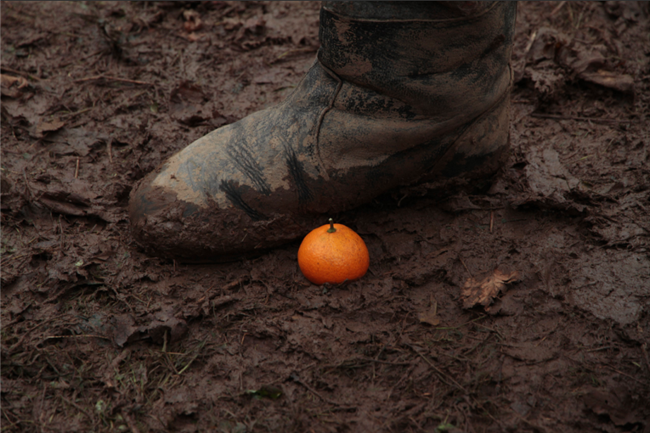 KC: How are tangerines a metaphor in the film? Both of these characters are working hard to harvest the tangerines in time, before they miss their moment, and before a full-scale war breaks out in their neck of the woods. KC: So the fruit of their labor speaks to their longstanding relation to the land — not only to the soil, with their work, but to the region, to the landscape, to Abkhazia and their history there? It’s interesting that there are no women in your film. It’s as if you replace the cinematic convention of women as a source of desire with the abundant tangerines, and your rustic atmosphere fulfills our sense of beauty and pleasure through nature. Yet you highlight, through repetition but never through close-ups (which could make it a fetish), the photo of Ivo’s granddaughter. Why? ZU: We wanted to show that the men have been at war for awhile, and so away from women and their loved ones. The photo of Ivo’s granddaughter in his home gives us a chance to make that point, because both soldiers, in turn, gaze at it and talk about it, and Ivo is extremely protective of her. On these occasions he’s completely in character, because he tells the Chechen mercenary, “Don’t even think of it —” (i.e., of making remarks about her). Chechens are fighters, but Estonians are not, so Ivo speaks his authority instead of showing it. That’s his nature. KC: You use so little dialogue in the film that when it does come up, it really counts. The power of words is hard to come by in today’s cinema — or in today’s world, for that matter. The code for cinematic language, especially in Hollywood, has always been “show, don’t tell,” so when you can create a character who commands authority by speaking, and so sparsely and tersely, at that, it’s quite a feat. He’s a quiet kind of icon. ZU: The character is based on my grandfather, who was really like a hero for everyone. He was very strong in human values. His principle was to live a very honest life, to be absolutely straight-forward. I thought of him as I was writing the script. KC: A strange kind of lyricism is at play in Tangerines. We give ourselves over to the film, with a wish and a hope — it seems, after all, quite unlikely that a Chechen mercenary and a Georgian soldier, mortal enemies at war, would go so far as to become friends, even allies in a battle. But the film presents the possibility. Is this what you deem to be the role of cinema — of art — presenting possibilities? Are all your films so lyrical? ZU: I’ve directed five features, and my films are all different from each other in genre and style. The first was called Three Houses: it’s the story of a painting from the 19th to the 21st century, told in three separate stories, using three distinct genres, and taking place in three different periods in history. My second film, The Guardian, was not written by me. I just directed it; but it also deals with human values: do you stick to them, or do you compromise them? Where is this place, where you stand or fall as a man? KC: What roles have filmmakers such as Eldar Shengalaya and Otar Iosseliani played in relation to your work? ZU: Iosseliani was my teacher. Now he’s living in France. Eldar Shengalaya is my predecessor. He was head of the Georgia Filmmakers’ Union for 36 years. One year ago, I was elected to head it; the term will last five years. The organization unites all of our filmmakers, and they all want to become members because it’s very prestigious. They give awards for the best Georgian films, somewhat the way the Motion Picture Academy of Arts and Sciences does here. Ten years ago, I headed the Georgia National Cinema Center for two years. It decides who gets awards of government money from the Minister of Culture. I couldn’t make films during that time because it would have been a conflict of interest. KC: Are there international filmmakers who have influenced you? ZU: Fellini, Pasolini — all of Italian cinema has inspired my work. So have Italian Americans, such as Coppola. I like the films of Lars Von Trier, and I absolutely love Kieslovsky. KC: Where did you learn the art and craft of your filmmaking? You come from a long line of brilliant Georgian filmmakers. Did you enter cinema from another art? ZU: I was sixteen when I decided to become a filmmaker. I understood that if I couldn’t be a filmmaker, I’d be lost. I entered the University of Cinema and Theatre in Tbilisi, graduated in five years, and then shot my first feature, Here Comes the Dawn. It was submitted for the Oscars, presented in 1999 for the Academy Awards in 2000. So Tangerines is my second submission for the Oscars. I was mentored by Lana Gogoberidze. My Professor of Editing was Otar Iosseliani, who also mentored me. I love all the arts, and I find them all in cinema. For two of the five films I’ve made so far, I was the director but not the writer. KC: Since the first generation of Shengalayas (at least as far back as I know) Georgian cinema has always been characterized by its own humor and wild imagination. Can you comment on how Georgians use humor — or see the world — differently? A Variety review referred to Tangerines as “a seriocomic drama.” Are we meant to laugh? What did you want to present in your film that might distinguish it from other films on the wars of the region? ZU: Georgians can say very serious things about dark subjects but still find something a bit light and funny. It’s common in Georgian culture — it’s our national character. IF: Even in difficult times, beset with death or war, they still dance and sing. In the most tragic of times, the approach is still “dancing on graves.” Georgians are very creative. KC: Regarding the concept of cultural identity through the arts, a Lithuanian critic recently made a fairly provocative claim: Georgia is the only country left with a real national cinema, one with its own integrity. IF: It’s an old, old culture in Georgia, and it likes to define itself as its own. The people have been concentrated within the region for a very long time. They say the word for wine, “vino,” is Georgian. That’s what they say — how can you control it? Georgians cry in one second and laugh in the next. They are more direct and bold, strong, at intervals. KC: Is there something uniquely Estonian in the film — satire, such as in Mushrooming, Estonia’s Oscar submission two years ago? IF: Estonian humor is very dry, almost British. It’s not so unique, but maybe a matter of under-estimating ourselves, because we’re a small nation, so we take something from everywhere. We have a lot of self-irony — we’re used to laughing at ourselves. KC: Where did you get the idea to place an Estonian character (actually, you have three) at the center of your film? How long has Ivo been in Georgia, and why? How confident were you of making him the mediator/inhibitor/negotiator of the conflict? ZU: A retrospective of Georgian cinema was held in Talin, Estonia, a small festival called “Georgian Film Days,” and when I was invited there with my film, Three Houses, I met with the organizer of the festival, an Estonian producer, who almost on impulse asked if there was anything we could do together. I thought of the war, and when I went home I put it all together fast. I wrote Tangerines in two weeks, and we shot it in five weeks. KC: Did you know Estonians in Georgia? What brought Estonians to settle in Georgian villages for over a century — exile? Was there a “movement” to repatriate to Estonia during the Georgian war with Abkhazia in 1992? Do you see a historical-political relation between Estonia and Georgia? ZU: Regarding relations between Georgians and Estonians, before making Tangerines, I didn’t personally know any Estonians in Georgia, but I knew of Estonian villages in Abkhazia. And both of us — Georgians and Estonians — were well acquainted with each other’s cultures. The fact is, Estonians had these villages in Georgia for over a hundred years. The czar granted this opportunity of re-settlement to some Estonians freed from slavery who then had nothing, no land of their own. The three separate nations — Abkhazia, Georgia, and Estonia — were all part of the Russian Empire then, under the czar. He wanted to develop another region, so he offered to send a few thousand Estonians to Abkhazia. So since the second half of the 19th century, Estonians lived there for generations. They lived a peaceful, comfortable life there in the warm climate with all the vineyards, and they did very well. They prospered, because they were hard-working. In 1992 when the war broke out, Estonia had been free from Russia for a year by then, and the Estonian President gave the opportunity to Estonians for repatriation. He sent planes there for an airlift. It was sad, because they didn’t want to leave, but soon the villages were empty. IF: We are both small countries and we have both been part of the USSR. Try living as a small nation next to Russia! But we both speak the Russian language. That’s one good thing that came of the Soviet Union — from separate republics, we can all communicate with each other, because we share a common language. KC: How much money did Estonia contribute to the film? How was the labor divided? IF: The budget of 600,000 Euros was almost 60% Estonian and almost 40% Georgian. EurImage also supported us. When we got there to shoot, it was an empty tangerine plantation. Okay, there were some tangerine trees there with tangerines on them, but we had to build the whole set — the house, the crate factory…. 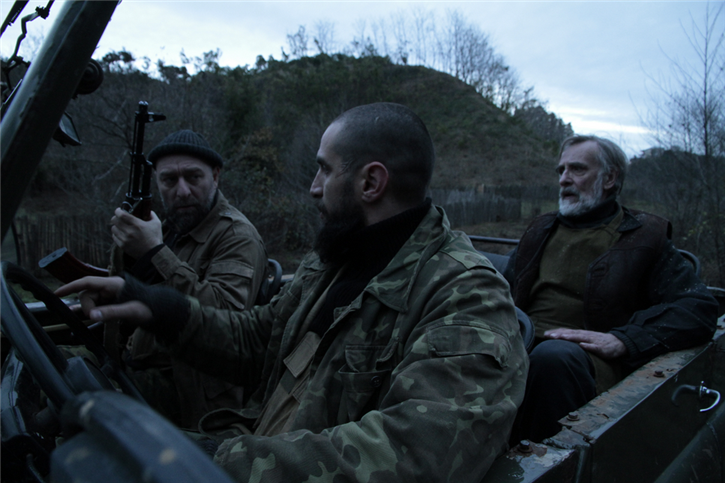 ZU: We shot in Guria, which has the same landscape as in Abkhazia, but it’s in Georgia, because it was too dangerous in Abkhazia. KC: How did you decide on the Estonian actor and film/theatre director, Lembit Ulfsak (Ivo) for the lead role, and on the Estonian theatre director, Elmo Nüganen (Markus)? How did you direct them in particular for your film? Can you compare the two as characters? Markus seems almost a comic foil for Ivo…. ZU: Since I knew Lembit Ulfsak from childhood (he’s iconic, awarded the ‘Best Male Performer of the Century’ in Estonia in 2012), I wrote the role of Ivo exactly for him. The Estonian producer offered me the two Estonians, and all the Georgians auditioned. I directed all the same actors in the same way — I’m very strict. The film was heavily rehearsed, so they knew their roles well. There was no improvisation. But Markus (Elmo Nüganen) was used to the theatre and gave the grandest theatrical performance, so we had to minimize, minimize, minimize. IF: As the Estonian producer, I was on the set for the entire shoot and had to coach the actors in the Estonian language. I get involved in a very creative way (for example, I also helped with the sound recording and building the sets). KC: Can you talk about your visual style? IF: Zaza sees the whole film from the beginning. He used very, very small pans and little camera movement. The Director of Photography, Rein Kotov, who also shot Mushrooming, decided the lighting. He was attached to the film before I was. It was Zaza, then Rein Kotov, then the main actor Lembit Ulfsak, all from the beginning. KC: What format did you use for shooting your film? 35mm? HD? Alexa-Red? Wide screen? ZU: We used the Alexa camera and shot in HD, Cinemascope. Many DPs (Directors of Photography) have asked, is it film? They can’t believe it. Doctor: The car should blow up. Margus: That’s only in the movies. Ivo: Movies are a fraud. This dialogue is very self-reflexive of cinema, and it’s a wry critique of Hollywood-style movies. KC: By “us” do you mean Georgian and Estonian filmmakers? But of course, we do, we need you, in the audience, because we’re laughing…. There’s another, achingly poignant use of media self-reflexivity in Tangerines, this time one using sound. Throughout the film, the Georgian soldier Niko has been rewinding an un-spooled audiotape cassette with his finger. At the end of the film he’s gone, but Akhmed plays the tape in his jeep as he drives home through the mountains to Chechnya. It’s the first time we’ve seen this expansive location with its majestic beauty. The song looms from the screen as if it’s the voice of Niko, and the singing gives goose bumps to the viewer. The words aren’t translated. What are they? Director: Zaza Urushadze; Producers: Ivo Felt, Zaza Urushadze; Screenplay: Zaza Urushadze; Cinematographer: Rein Kotov; Editor: Alexander Kuranov; Sound: Harmo Kallaste, Ivo Felt; Music: Niaz Diasamidze; Art Director: Thea Telia; Costumes: Simon Machabeli. Cast: Lembit Ulfsak, Mikheil Meskhi, Giorgi Nakhashidze, Elmo Nüganen, Raivo Trass. Color, HD Cinemascope, 89 min. In Estonian and Russian with English subtitles.